barbarapeterson - adorable. I know you are enjoying your family time – stay off that computer! Starla - That is soooooooo precious!!!!!! I loved it!! I laughed out loud!!! I love you guys!!! I am soooooooo happy for you!!! Thank you for sharing!!!! Tanya - LOVE THEM! They were all so funny! Hope looks like a natural feeding Jaylen! Kenny Roy - These are great!! You have such a fun and wonderful family! Tanya - hi guys i loved the video i think you should put the last one on afv = americas funny videos! Mandy Bee - I think I’m going to have nightmares of Hope’s giant face!! Those were so funny! Thanks for sharing! Joanna Aton - glad to see Jaylen is doing so much better! Hope is such a natural with the baby! Holly Smith - haha! I definitely think Hope has a future in movie-making and gotta love the one of you on the computer…priceless! K Simari - awwwww. look at her!! that is the cutest thing ever! that is so funny how he got you on the computer. Hope is so adorable helping take care of him. it is so sweet!! Mandy Bee - Poor baby. I’m so glad everything is alright. I couldn’t even imagine how hard it would be to go through all of that. Definitely a blessing in disguise. PS – Jaylen is so CUTE. I usually don’t say things like that about babies. Aunt Deb - Oh Amanda – he is just beautiful – I love the picture of him and Jason doing the high five. So glad that everything checked out fine and yes we should all count our blessings. Glad everything is well now. I’ll keep you all in my prayers. Patrick - So cute!! So glad he’s doing fine!! Kesha - wow!He is so handsome! thank god everything is ok. the pictures are so adorable. father and son. its so precious. 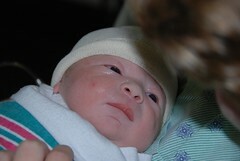 Colette - You have been blessed with a beautiful and healthy baby boy. Angela - Wow! I’m glad he is doing great and healthy. What beautiful pictures. Moraima - I am glad to hear everything turned out OK.
Aunt Becky - Jaylen is a beautiful baby, and I am so thankful that he is healthy and nothing was seriously wrong. I pray that each day with him will unfold in joy and delight as you watch him grow. May God bless you all with favor, grace, and love! Starla - CONGRATULATIONS!!!!!! He is soooooooooooooooo adorable We are so happy for all of you!!!! 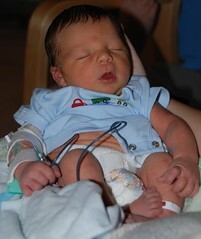 I can’t wait to hold him Hope a big sister WOW!!!!!!!!!! kristy pennino - …and happy birthday to you, too!! Tyson - Congrats Amanda, that’s amazing news and I am very happy for you! Wendy Johnson - Congrats on the baby Amanda. Hope looks like a helpful and loving big-sister with her new baby brother! Have a wonderful 6 weeks off. We miss you at school! Angela Scarlato - I’m so happy for you. Congratulations! Lora - CONGRATULATIONS AMANDA! Wow! It seems like yesterday I got the email that you were pregnant. He is adorable! Holly Smith - CONGRATS AMANDA!!! (and happy birthday to you too!) He’s absolutely beautiful, and I love the name! but even BETTER…he shares a birthday with ME! haha get lots of rest and enjoy the time off! k. simari - awww! Amanda he is precious! i really like the name you chose its not a very common name, i love that. I was looking at the photos and Hope really looks happy. She is going to really have great time with her baby brother, it looks like she is already showing that she is protective, just by her body language in holding him. I think it is the sweetest thing ever! God bless you and your family, and Hope would be the best one to know, that you indeed are a good mommy. Candace Crowe - My congratulations to a wonderful mom, dad, and sister!!! Life is indeed very full of the amazing wonders of God. Keep going the distance. Happy B-day to both of you and congratulations for being so strong for your family. Note for Hope: Make mommy proud and teach your brother all your artistic talents, you guys will make a great creative team! Kenny Roy - Congratulations!! I can’t wait to meet him!! Cameron Moll - Congrats to both of you! Congratulations on your new gift!!! !Enjoy every little minute, second because as some of us know, time flies by. Kimberley Klein - Congratulations Amanda! Lisa - Congrats Amanda! He is so adorable!! Hope will make a GREAT BIG SISTER!! Mandy Bee - Yay! Finally!